Dresden is the capital city of Saxony in Germany. It is situated in a valley on the River Elbe, near the Czech border. The Dresden conurbation is part of the Saxon Triangle metropolitan area. 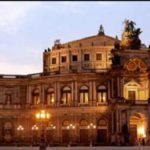 Dresden has a long history as the capital and royal residence for the Electors and Kings of Saxony, who for centuries furnished the city with cultural and artistic splendour. The city was completely destroyed by the controversial Allied aerial bombing towards the end of World War II. The impact of the bombing and 40 years of urban development during the East German socialist era have considerably changed the face of the city. Some restoration work has helped to reconstruct parts of historic inner city, including the Katholische Hofkirche, the Semperoper and the Dresdner Frauenkirche. Since the German reunification in 1990, Dresden has re-emerged as a cultural, educational, political and economic centre of Germany. The Elbe Valley of Dresden was an internationally recognised site of cultural significance by the UNESCO World Heritage Committee for five years. After being placed on the list of endangered World Heritage Sites in 2006, the city had its status as world heritage site formally removed in June 2009, for the wilful breach of the UNESCO World Heritage Convention, due to the construction of a highway bridge across the valley within 2 km of the historic centre. It thereby became the first location ever in Europe to lose this status, and the second ever in the world.